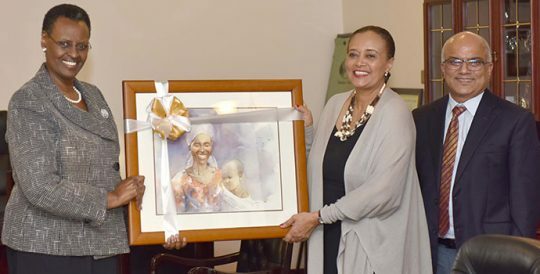 First Lady and Minister of Education and Sports Mrs. Janet Museveni hands over a gift to Ida Girma the out-going UNICEF Representative who was bidding farewell, while UNICEF’s Chief Of Education Nebendra Dhal looks on at State House Nakasero on Monday. First Lady Janet Museveni welcomes Zambia’s First Lady Esther Lungu at State House Nakasero on Monday. Beingd is the Minister of State for Gender and Culture, Peace Mutuzo. The First Lady and Minister of Education and Sports Mrs. Janet Museveni in white together with Kyenjojo Woman MP Esperenza Muhenda pose with kyenjojo Woman in Action Group during the Women’s Day celebrations at Kyembogo Playground Kyenjojo District on Saturday. First Lady and Minister of Education and Sports Mrs. Janet Museveni, State Minister for Higher Education Dr. J.C Muyingo and other officials arrive at the office of the President Conference Hall in Kampala for the UNATU High Level Stakeholders Meeting on Saturday.